The General Health Questionnaire (GHQ) is a screening device for identifying minor psychiatric disorders in the general population and within community or non-psychiatric clinical settings such as primary care or general medical out-patients. Suitable for all ages from adolescent upwards (but not children), it assesses the respondent’s current state and asks if that differs from his or her usual state. It is therefore sensitive to short-term psychiatric disorders but not to long-standing attributes of the respondent. The appearance of new and distressing phenomena. 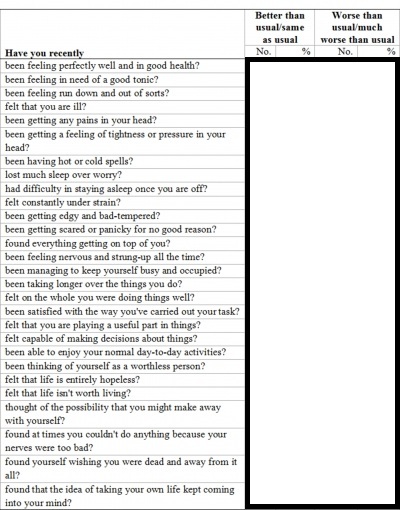 The self-administered questionnaire is an ideal screening device for identifying non-psychotic and minor psychiatric disorders to help inform further intervention. GHQ-28: a 28 item scaled version – assesses somatic symptoms, anxiety, and insomnia, social dysfunction and severe depression.